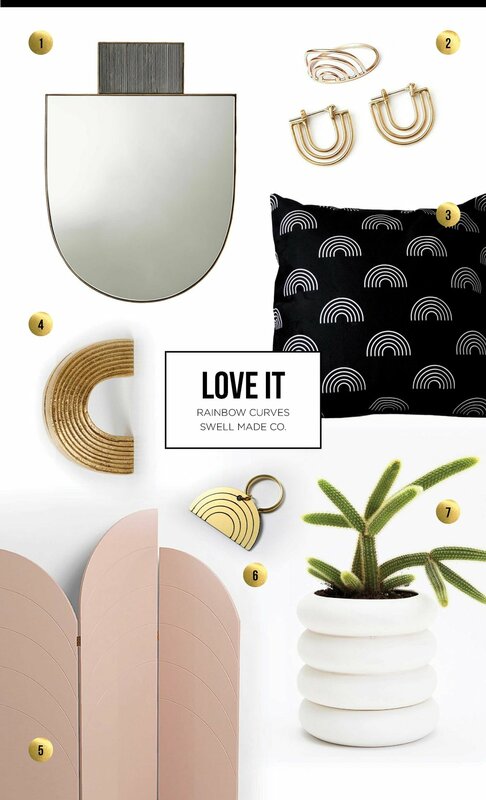 Love It | Rainbow Curves with Swell Made Co. I have been swooning over this dreamy style for a while now. Curves (or rainbows, or arches), a combination of feminine and nostalgic colour palettes, an ode to retro styles and Wes Anderson films; this whimsical, geometric and elegant aesthetic is popping up around the globe in hotels, restaurants, shops and living spaces. Where minimalism and luxury meet, you'll often find pastel hues, velvet, curved cane pieces, brass and almost always terrazzo (another one of my favourites). Curved features appear in architectural details, fixtures and furniture reminding me art-deco, but with a new and modern approach. Biasol, a Melbourne based interior design firm, creates jaw-dropping examples of spaces in this style which you'll see below and on Pinterest. Kusko Mirror found at Black Rooster. A statement in itself, this curved mirror with gold-finished iron frame and a black chiselled marble crown will become a true focal point for any room. Mini Porta Ring and Dimi Earrings by Tiro Tiro. Using traditional craft practices, Tiro Tiro makes covetable jewelry pieces for everyday use. These adorable concentric arch pieces are available in 14K gold or sterling silver. Rainbow Patterned Velveteen Throw Pillow Cover by Swell Made Co. A super-soft throw pillow cover for snuggling and brightening any room with its rainbow inspired pattern. Brass Arch Card Stand by Ferm Living. This little brass arch explores using geometry as a focal point. Place it in your space to hold cherished photos or notes. Unfold Rose Room Divider by Ferm Living. A piece of furniture which is at once a decadent aesthetic and a practical design solution. It creates the feeling of an extra room in a small apartment but may also add a luxurious vibe when used as a decorative element in a larger space. It has curved milled grooves and a high-gloss finish that combines an elegant look with a minimal décor. Gold Rainbow Curved Keytag by Swell Made Co. This gold acrylic keytag will brighten your day with its adorable rainbow inspired shape. Perfect for the eternal optimist. Stacking Planter by Area Ware. This simple curvy planter discretely integrates both a planter and saucer into one form. And it's stackable. Thanks for reading! And as always, I've rounded up a few examples below of this stunning style over on Pinterest. Give Swell Made Co. a follow to see more. Click the images below for original the sources.